Wireless Local Area Networks (WLAN), known as Wi-Fi, allow workers to stay connected to an organization's network, allowing them real-time access to information whether they are at their desk or on the move. Wireless Ethernet link / Wi-Fi technology provides cost savings and creates flexibility with rapid deployments and expansions, without the high cost and time needed for traditional cabling. Employees become more productive when they can access information when and where they need it, whether they are using the internet, using email, or accessing a corporate database. Wi-Fi can support both voice and data. Wi-Fi provides instant, effortless connections for desktops, laptops and handheld devices. 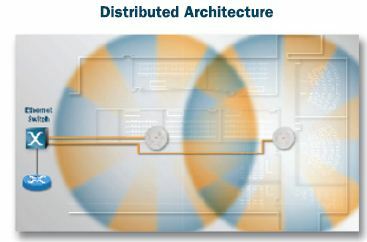 WLAN's are made up of wireless access points (AP's) that are connected to the LAN. AP's are radios that use IEEE's 802.11 technology, that is commonly represented as 802.11b (2.4GHz @ 11Mbps), 802.11g (2.4GHz @ 54Mbps), 802.11a (5GHz @ 54Mbps) and now 802.11n (using either 2.4GHz or 5GHz @ up to 300Mbps). A single enterprise class AP can support roughly 40 plus users at any given time. Wireless Ethernet technology is extremely secure when implemented properly. So what happens when you put thousands of people in a small area all trying to get a wireless Ethernet bridge using Wi-Fi connectivity? If you do the math you would have to add a lot of wireless access points in an area to handle the load. With Wi-Fi 802.11b/g 2.4GHz there are only three non-overlapping channels. In Wi-Fi 802.11a there are 8+ depending on the channel widths. Most all devices will try and use the 2.4GHz 802.11b/g Wi-Fi first by default. With only three non overlapping channels it becomes difficult to put a lot of AP’s next to each other in a small place, especially if the AP’s are using omni directional antennas. You have to do strict channel and power planning. Done correctly though a Wi-Fi network can free users to be more productive and mobile. It can be less expensive to install a wireless Ethernet / Wi-Fi network than to run cables and install jacks throughout a facility, especially for organizations that need flexible and scalable network architecture. According to Gartner, the cost for deploying and managing a wireless network can be anywhere from 15%-40% lower per employee versus wired alternatives for some companies.